So there I am, just coming to the end of the first month of my 3 month commitment to greenskins, when up pops this news. Avatars of War, well known for their lovely metal character models, have taken their first steps into the plastic regiment market. Full details can be found here. From the picture and previously released videos they certainly look impressive. I am pretty sure I could find a space for them in my dwarf army, which has not received much attention of late. Recently, I have been pondering what to work on after the greenskins, and maybe this is a sign from the, er, miniature geek gods. 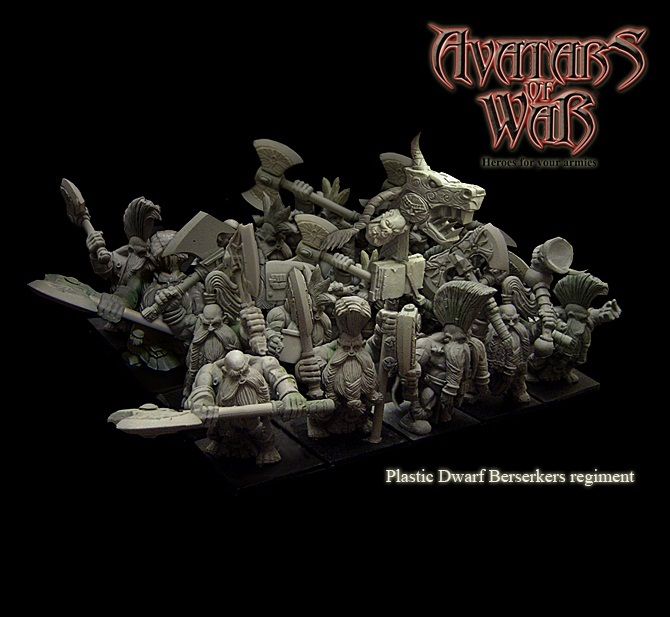 It would be quite fitting to get my orcs and goblins up to 2500 points painted, then do the same for my dwarfs. I really hope that the sales for these models go through the roof and a company producing high quality plastics at reasonable prices gets established. I will be doing my bit and ordering a box. 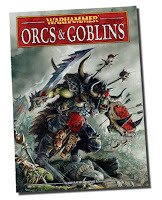 It will probably take some time for the plastics range to get up and running, but who knows, maybe a future post will be me talking about plastic goblins, chaos marauders or even chaos dwarfs. It's a tantalising prospect. However, that's just wishful thinking at the moment. Back in the real world, my next post will be back on track with the greenskins - here's a clue, it's big and scary and it's got eight legs. This little fella is a night goblin shaman built from a few plastic bits. 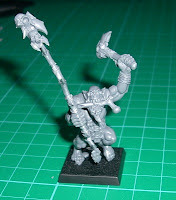 The body and left arm and half the right arm come from the night goblin box set. 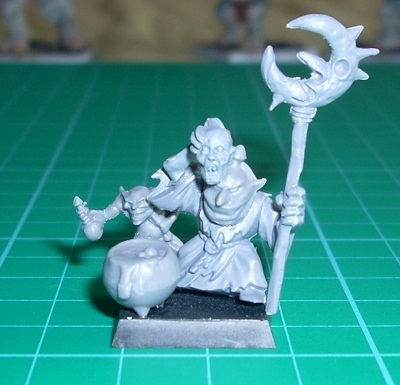 The shaman head, the bubbling cauldron and the snotling assistant are from the fanatics sprue. The top of the staff is cut from a marker from the Battle for Skull Pass set. And the right hand holding up the shrunken head is from, well, if you can identify that bit you have a big clue as to my next big project. But let's not get distracted by that. In tandem with another night goblin shaman I am hoping that the pair of them will give me a pretty potent magic phase for a small cost. Two level 2 shamen gives me four Little Waargh spells, two chances to channel an extra power dice, a lore attribute that gives me the chance to sneakily steal opponent's magic dice, and mushrooms to really give me the edge in casting (except when I roll a 1 of course). For those that are unaware, the shaman has to eat a mushroom each time he casts a spell, adding it to his casting roll. This is a free dice not taken from the power pool. If a 1 is rolled, the mushroom is poisonous and might wound the shaman. It's a brilliant little game mechanism that really captures the inherently powerful but risky aspect of the night goblin shaman. It seems like forever since the new book was talked about on the web, let alone released to the masses, but finally I have played my first game with the new army list. I simply packed in as much of my existing army plus a couple of new units into 2000 points and played a chaos warrior infantry heavy army. I was keen to see the look on my opponent's face when he found out how much better the animosity rule has become (worse from his side of the table). I had six units testing and, yes, you guessed it, not once did I roll a 1 in the entire game! The scenario called for random placement of troops, which of course meant the trolls were stranded in one corner with the characters on the opposite side of the table. Drooling and dribbling and wandering forward aimlessly, they were hit in the flank by 3 dragon ogres with extra weapons. Not good. They took a real hammering, but regeneration came to the rescue and all four trolls survived, even managing to get a wound or two back on the dragon ogres. But flank charges and low leadership are not a good combination and off they ran in turn 2. And turn 3. And turn 4. And, well, you can see where this is heading. But wait, it gets better. The best thing was they outran the dragon ogres and survived plowing through two enemy units and a blood forest. Sadly, they managed to stamp on not just one, but two of my night goblin fanatics, who were whirling round dangerously close to lots of heavily armoured chaos warriors. Curses. This took it's toll on the trolls, last time I looked there were just two of them left, standing in front of a large rock asking it for directions back to the battlefield. Ah well, at least they didn't die. In a more standard game with better leadership I have high hopes for them. At 45 points each I think they are an absolute steal. Surely the savage orcs would do better? 24 biguns with extra weapons, deployed six wide, that's 25 attacks on the charge, S5 with choppas. That's competing even with chaos warriors' bucketfuls of dice. Granted, they are far less resilient, but surely they will cause damage on their first charge. Well, theoretically yes they would. Getting flanked charged by warriors while a giant jumps up and down on them was not my dream first time scenario. I didn't even get to prod the giant with the big stabba, charging is essential for these boyz. Sadly, a very early departure for the tattooed naked ones. Things can only get better. My lone night goblin shaman had an absolute blast, he was scoffing mushrooms and casting spells all game long. He did swallow a couple of poisonous ones but survived the whole battle. His spells did not have a huge effect, the random nature of the deck didn't go my way this game but I have a sneaky plan to use two of these little beggars in future games for a potentially effective and very cheap magic phase. In the end, it was down to the old stalwarts of my army, the warboss and black orcs, to dish out the pain. The warboss was an absolute beast, surviving a flank charge from a unit of chaos knights and swatting them into the ground with his ogre blade. The black orcs had a real slugfest with a unit of Khorne chaos warriors, they practically wiped each other out, but a well timed intervention from the orc characters and a chariot finally swung it for the greenskins. The new book feels good to me, not just from this first game, but from reading about it on the web ( the excellent Troll Tales is an absolute must visit destination for greenskin players). It seems to hit the right blend of brute orc power and sneaky goblin cunning. I am looking forward to adding a few of the more wacky elements, after I have finished painting the savage orcs and trolls of course! By then, my troll-like attention span may well have wandered on to something else, but for the next few months, it's gonna be green. There's a free savage orc shaman included in the box of plastic savage orcs! You just have to be a bit cunning like Mork (or is it Gork) to find it. It's not very often that I buy brand new release items, I am too old and wily (or is it cynical) for that kind of thing. It's very easy to get sucked into the marketing hype and internet clamour. I usually wait a few months to check if a) I still like the new stuff or b) I can pick it up a bit cheaper on ebay. But with the release of the new savage orcs, I was reckless and pre-ordered two boxes. I want to get the maximum value from these two boxes. I am doing this in two ways. I am building a regiment of 24 figures, even though two boxes of 10 theoretically holds just 20 figures. With a bit of multiple basing trickery it's easy enough, but more on that next time. The second bonus is this free shaman. Obviously it's just a kit bash using the components. The staff is built from a couple of chopped up bows and the dangly wotnotz from the big stabba. It's not difficult, no sculpting involved and the end result is a very nice model. Here's a scan of one of the photos I found in the loft. 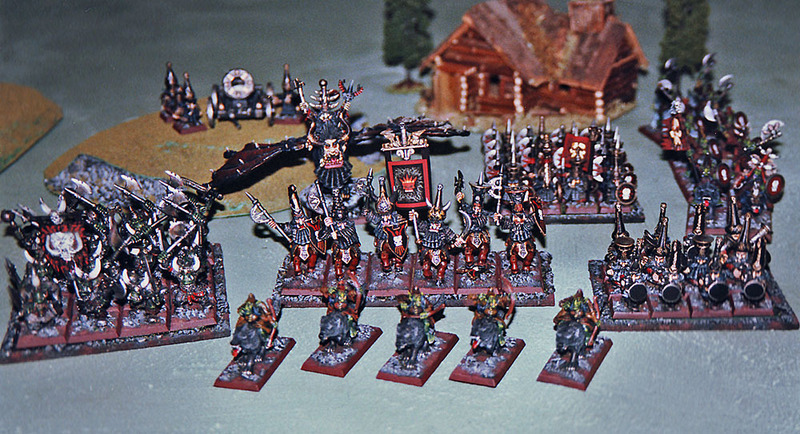 It shows the majority of my old Chaos Dwarf army - I think there were some hobgoblin archers too. This was a 2000 point army about a decade ago, it seems tiny in comparison to armies of 8th edition. It's photographed on my brother's "gaming board" - a green cloth on the dining table, a couple of basic polystyrene flocked hills and a little wood hut he bought from a garden centre. It's almost laughable when you look at the battlefields of today, but this was the norm back then, even the battle reports in White Dwarf were fought on tables like this. And as basic as it is, we had some good times fighting over this hut! Sadly, I no longer have this army. Over the years I have collected and painted numerous forces like this, including High Elves, several Chaos armies, at least two Undead - most of them I subsequently sold when I relocated and found it difficult to get to a gaming area. I don't mind that, I have since re-collected several armies and have more than enough to keep me painting for years to come! But this is the one army I wish I had held on to. I was up in the loft yesterday, sorting through some old photos which I intend to scan and store digitally. I came across some buried treasure...of sorts. In among the piles and piles of old family snaps were some pictures of a couple of my old armies. I will get them scanned and post a few samples in the next few weeks. I also found my old boxes of White Dwarf, which I had bought occasionally during my Heroquest era, then pretty much every month for years after I took up Warhammer from issue 153 onwards. That was in 1992, this picture shows the cover of that White Dwarf, it was also used as the box art for the fourth edition game, my first copy. 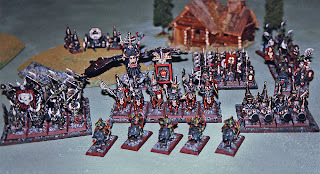 Naturally I started to reminisce about my first games, my old armies, my painting, etc. Then I realised (with a sigh of resignation at the passage of so much time) that it was nearly 20 years since those first faltering steps. I want to mark the anniversary in some way, some big way, which is why I am thinking about it now, 18 months before the actual event. The first thought I had was to recreate the armies from the fourth edition box. 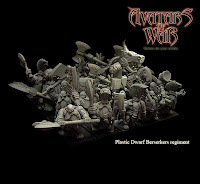 If I remember correctly it contained plastic figures (elf and goblin spearmen and archers) as well as cardboard pieces to represent the bigger characters and war machines - a high elf on a griffon, an orc shaman on a wyvern, an elf bolt thrower and an orc stone thrower. I actually have all these pieces, mostly in their current or recent form, some the original models from the early 1990's, some even painted already! So it would be relatively easy to put them together in the coming year. It's achievable but not particularly balanced in the current version of the game. The second option is to recreate the main characters and units from the fourth edition box set, but build them as part of my current army projects. For example, include an orc shaman on a wyvern and a stone thrower, plus archers and spear gobbos, in my existing greenskin army. 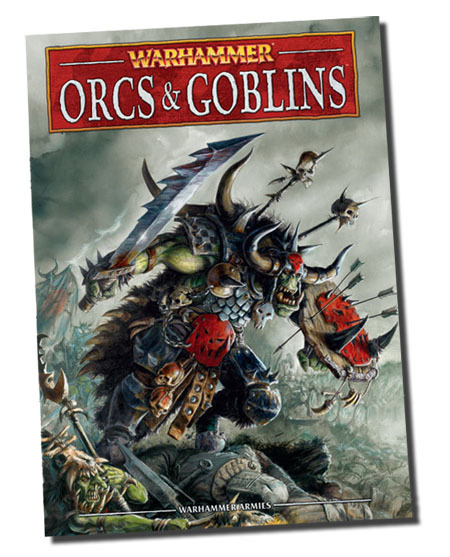 This is a tempting option, as I will be working on the greenskins in the near future, with the allure of a shiney new army book just days away. The High Elf army would be even easier to achieve, as I have long ago painted the griffon, speamen, archers and bolt thrower (along with other troops). An 8th edition equivalent of the 4th edition starter set is a tempting option. The third option is not particularly related to the fourth edition starter set, there's not an elf or goblin in sight. 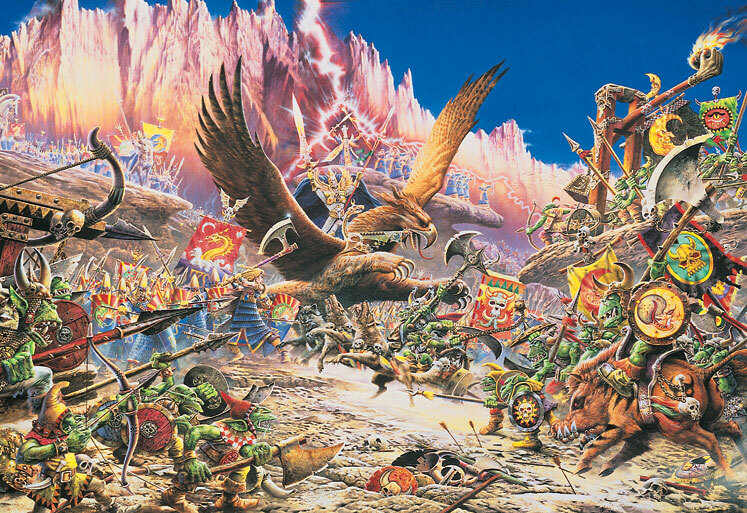 Broadening my thoughts to my Warhammer history, I could attempt to recreate my very first fully painted army. This came about because I attended my first tournament in 1997, so this option would be a joint celebration of 20 years of Warhammer, 15 years since I first entered a tournament. This is probably the most exciting option because it allows me to rebuild one of my first armies, but also I would incorporate some ideas I have harboured for yet another army, giving me a "two birds with one stone" army. So this is the most ambitious option, the most exciting in my head, but also the most daunting in terms of work required. If I do go for this option I will have to make a start in summer this year.